This is the second book in the Destiny in Deadwood series but you can also read it as a stand alone. All Liam Anderson wanted after the War Between the States, was a little peace. After seventeen years in the army, he’s tired of fighting and killing. Having lost his beloved wife to influenza, he’s tired of hurting. And seeing his baby brother framed for murder, he’s tired of injustice. He left everything behind to help his brothers escape, packed up his children and possessions, and took them all to a gold claim in Deadwood. Miss Eleanor Smith is a thirty-two year-old spinster. She gave up her dream of a home and family a long time ago. Instead, she has spent her life traveling the world, ministering to the weak, the injured, the poor, and the forgotten, following her preacher father from one hell hole to another. From what she’s seen of men and the world, she’s better off taking care of herself. And she gets along just fine, until she literally falls into Liam’s arms, gets in the middle of a fight that isn’t hers, and becomes a pawn for an enemy’s revenge. Deadwood was supposed to be a fresh start for Liam Anderson and his younger brothers, but trouble followed him and his children. And when Eleanor disappears, only Liam can rescue her. The headstrong, independent woman awoke his dead passion, but refused to surrender to his touch. Can he convince her that merely surviving isn’t enough? Despite his sins, he’s the only man who can save her, and she’s the only woman strong enough to heal his broken heart. BAM! BAM! BAM!He looked up from the book he read and glanced at the mantel clock. One of the few things he hadn’t packed away. “What in the world? Who would be out in this weather at this hour? “Can’t until the kid here,” he poked Jake in the back with his gun, “is inside and we’ve talked to you. ”Jake, the youngest of his brothers, walked into the foyer of the house, followed closely by Zach. He stared down the hallway, packed with luggage and boxes down to the parlor, but didn’t question it. Didn’t even seem to notice that the house was packed up ready to move. “Sorry to do this to you, Liam. I know you’re leaving tomorrow,” said Zach as he holstered his gun and dripped water onto the foyer floor. He threw his had onto one of the steamer trunks. Jake followed suit. It was times like these that the difference between his brothers was so striking. Zach with his nearly black hair and dark blue eyes. There was one in every generation with the coloring of their Gypsy great grandmother, Zach was theirs and their father had been the one in his generation. It was rare to have two gypsies in the same family, usual it was an uncle or aunt rather than a parent of the latest child with the coloring. Liam was somewhere between the two, with light brown hair and gray eyes. His children were different as night and day, too. Ten year old David resembled Liam not only physically but mentally too. David always seemed to weigh his words before he spoke them. Whereas Hannah, the gypsy of her generation, said whatever came into her little head. She was only five, but even at her age, David had been as contemplative as he was now. **SPECIAL ANNOUNCEMENT: Cynthia will also give away an ecopy of HEALED BY A HEART to one lucky reader who comments on her Book Blast blog. 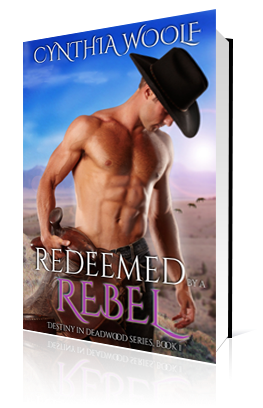 Don’t miss this chance to read this new book in the Destiny in Deadwood series. Thanks, Cynthia, for sharing with us! Thanks so much for having me today, Karen. I appreciate it. Wow! What a great prize. I’d definitely use it to buy any of your books I don’t yet have. I absolutely LOVE your writing. I really enjoy reading books that has a western romance favored. What a great gift for us the reader, thank you! Thanks for the giveaway opportunity! The Destiny in Deadwood Series sounds amazing!